Tile Films is currently in post production with a new international two part HD Docudrama, ‘Fág an Bealach’ (Fighting Irish of the Civil War). The drama, written and directed by Keith Farrell (Ireland’s Nazis) for TG4 and Smithsonian Channel USA stars IFTA nominated actor Don Wycherley (Rasaí na Gaillimhe) and is being edited in Dublin post houses Tangerine & Windmill Lane. ‘Fág an Bealach’ (US title: Fighting Irish of the Civil War) looks to reveal the untold story of one of the greatest military units of the American Civil War: The Irish Brigade. 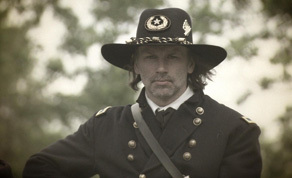 The two part docudrama stars Don Wycherley as the Waterford born, controversial General Thomas Francis Meagher and is presented by Irish-American actor Brian Mallon (Gettysburg). Other cast members in the project include Jonathan Byrne (Primeval) as Irish Brigade soldier James Mackay Rorty and Lesa Thurman (Thor) as American socialite, Maria Lydig Daly. This large scale production was shot over a period of seven months in 25 locations in Ireland and in the U.S. It features over 200 extras and includes in-depth interviews with internationally renowned historians and experts. Commissioned by Irish broadcaster TG4 and Smithsonian Channel USA, ‘Fág an Bealach’ is produced by Stephen Rooke (Death or Canada) and shot by director of photography Peter Robertson (West is West). Musician and composer Mike McGoldrick (Afro Celt Sound System) composed the original score for the series. Postproduction is taking place in Tangerine Post Production with 5.1 surround sound mixes created in Windmill Lane. The series is being edited over 12 weeks by Daithi Connaughton (Cé a Chónaigh i mo Theachsa) whilst online editor David Blanc managed the six timelines with material shot on a number of formats including HDCAM, XDCAM, Canon D5 as well as archive film footage. Marc Sherwin created motion graphics, titles and VFX that were added at full HD quality. Colourist Richard Callaghan is responsible for the docudrama’s grading.